Dr. Wilson Rumbeiha calls veterinary toxicology a poorly understood profession in the United States, and it’s easy to see his point. The equipment required to run a veterinary toxicology lab is costly, and some veterinary schools don’t keep a board-certified toxicologist on staff at all, Rumbeiha said. Unless there’s a sudden crisis, such as the 2007 pet food recalls during which cats and dogs across the country were sickened by food tainted with the industrial chemical melamine, most Americans simply don’t think about veterinary toxicology too much. But in the developing world – where infrastructure, health care and food safety concerns abound – it’s not so much that people don’t often think of veterinary toxicology. It’s that they have no conception of it at all. Rumbeiha, a professor of veterinary diagnostic and production animal medicine and a staff toxicologist in the College of Veterinary Medicine, has devoted much of his career to nurturing a better understanding of the importance of toxicology in developing nations such as Mongolia and his native Uganda. His international vision has led him to locales across the globe, working to instill a newfound awareness of the importance of veterinary toxicology. Since 2009, Rumbeiha has served as the president of Toxicologists Without Borders, a nonprofit organization that seeks to alleviate human disease contracted through exposure to toxins in developing countries in Asia, Africa, Latin America and the Caribbean. It’s not just an animal health issue, he said. His work bolsters food safety and human health as well. Rumbeiha traveled to Africa this month to lay the groundwork for a new program called One Health Uganda, which he hopes will allow ISU veterinary students to study abroad in Uganda to gain experience with communicable diseases that affect livestock, wild animals and humans. Rumbeiha has worked with Katie Davidson, a program assistant in the College of Veterinary Medicine, and faculty at the veterinary school at Markere University in Kampala, Uganda, to establish the study abroad opportunity. Progress on the program slowed last year due to concerns with the Ebola virus, but Rumbeiha said he plans to work on establishing some curriculum guidelines during his current visit to Uganda. He’ll also spend part of his time while in Uganda working with the Carnegie African Diaspora Fellowship Program, which fosters collaboration among African-born faculty living in the U.S. or Canada and faculty at institutions in Ghana, Kenya, Nigeria, South Africa, Tanzania and Uganda. Rumbeiha also traveled to Mongolia in 2014 under the auspices of the United Nations’ International Atomic Energy Agency to help locals establish toxicology programs. He said mining operations in Mongolia have polluted resources essential to herding cattle, creating a need for veterinarians with experience in toxicology to monitor and treat animals exposed to pollutants. 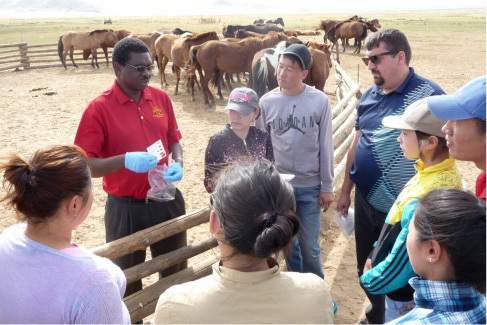 So Rumbeiha led workshops and practical lab demonstrations to improve the capacity of Mongolians to diagnose any toxicological challenges that threaten their food supply. Following his return to Ames, a Mongolian student visited Iowa State to receive additional toxicological training. Mongolia illustrates some of the classic challenges developing nations face, he said. For instance, it’s difficult to set up a new toxicology lab in Mongolia not only because of the expense, but also the lack of qualified technicians to maintain and repair the gear. Rumbeiha was born in Uganda, the oldest of nine children in his family. His parents and siblings still live there, and, though he’s now a U.S. citizen, Rumbeiha visits his family at least once a year. He earned his doctorate of veterinary medicine degree from Markere University in 1982. He was awarded a scholarship to Guelph University in Ontario, Canada, where he completed a Ph. D. After stints in industry and at Kansas State and Michigan State, he came to Iowa State in 2011, where he is one of two faculty toxicologists. But it was at Guelph in Canada where he discovered his interest in toxicology. “My eyes were opened at Guelph when I realized how important toxicology is and how many other disciplines it interacts with,” Rumbeiha said. Wherever his travels have taken him, however, he said he carries the perspective and priorities he learned early in life.